Mexico’s 43 Missing Students: We won't Be Silenced! This is the chant resonating across Mexico and even around the world these days. More than 40 days have passed since 43 students disappeared from the town of Iguala in the southern state of Guerrero, Mexico. On September 26, these students from the Raúl Isidro Burgos Normal School went from Ayotzinapa (where they live and study) to the city of Iguala. They were fundraising to attend the commemoration ceremony of October 2, 1968, a day when Mexican students were killed, tortured and incarcerated by the Mexican government during the massive student mobilisations, a phenomenon seen across the world. The Rural Normal Schools or Normales Rurales emerged as a political project of the post-revolutionary Mexican state in the 1920s as part of education reforms to modernise education and make it accessible to the countryside. They were established to train students from within rural communities to become teachers and subsequently serve their communities. One of the conditions for being admitted to the Normales Rurales was to be part of rural poor communities. These schools have since played an important role in Mexico in the struggles for social and political transformation and several important voices of dissent and rebellion have emerged from these schools. Two important figures who graduated from Ayotzinapa’s Normal School were Lucio Cabañas Barrientos and Genaro Vázquez Rojas, both important guerrilleros or revolutionaries in Mexican history. In the case of Lucio, after graduating from Ayotzinapa as a teacher, he returned to his village of Atoyac to teach in the local school. Besides the work in the school, he also organised farmworkers, causing tension with the government. In the 1970s, following persecution by the government, he went underground in the mountain region of Guerrero and founded and led an armed group called the Party of the Poor. In 1974 he died in an ambush by the army. Similarly, Genaro Vázquez was fired from his teaching position due to his political activity and later arrested by the state police. After escaping from prison he fled to mountains to form what later came to be known as the National Revolutionary Civic Association, an organisation that worked with and to unite several guerilla groups not just across the state but across the country. This tradition of dissident voices has continued to this day, despite several attempts by the Mexican government to try and squash them. During the Lázaro Cárdenas government (1934-1940), one of the last terms where the Normales Rurales still had great support from the government, community teachers and schools contextualised learning to local conditions, for example, to the predominantly agrarian context of the countryside. In 1945, however, funding for the schools was minimized and there was a standardisation of the teaching programs ordered by the Federal Secretary of Education (SEP), so their particularities were erased. Today, of the 29 original Normales Rurales, only 17 exist. On September 26, while the students of Ayotzinapa were in Iguala, police cars opened fire on them with no provocation, killing six people. Another 43 students were put in police cars, and that was the last time they were seen. Their present whereabouts are unknown. Since the drug war began in Mexico in 2006, more than 20,000 people have disappeared without a trace. According to official numbers, from 2007 to 2012 there were more than 1,21,000 homicides, and more than 50,000 since the current government of Enrique Peña Nieto came to power.The term narcopolitics has been used to describe how narcotraffickers and the government are mutually imbricated. In Mexico this is a reality. Government and narcotraffickers sometimes appear as a single institution, steeped in corruption and vested interests. In this context, it is important to note the role of the U.S. in the "war against drugs" and its intervention in the militarisation of Mexico. The drug war in Mexico has justified the 'securitisation' of the country where, in the name of “security and peace”, the army and federal police are invested with a lot of power and impunity. The army has committed several human rights violations; the cases of Inés Fernández and Valentina Rosendo are an example. Inés and Valentina are indigenous women of Guerrero who were raped by soldiers of the Mexican Federal Army in 2002. In 2010, the Inter-American Court of Human Rights sentenced the Mexican State for these crimes. I consider that we are now in a state of necropolitics: the power exercised to decide who lives and who dies. The numbers are frightening, but we need to give faces and voices to the people that have vanished: Who were they? What did they do for a living? Were they students or workers? What were their dreams? What made them sad or happy? Abel García Hernández is 19 years old. He comes from Tecuanapa, Guerrero. His father, a farmworker, has been looking for him since he disappeared and still has hopes to find him alive. Marcial Barando is 20 years old and comes from Costa Chica, he was in the Normal Rural, preparing to become a bilingual teacher (Spanish and an indigenous language). Benjamín Asencio Bautista, 19 years old, is from Chilapa and he was a community educator before joining the Normal Rural. José Ángel Campos Cantor, 33 years old, comes from Tixtla Guerrero. These are only four names and faces of the 43 students that are still missing. These are indigenous students fighting for a better life, for an education engaged with a social and political reality. On November 7, Jesús Murillo Karam, the attorney general of the Mexican federal government, organized a press conference about the missing students and, based on the testimonies of two detainees, claimed they were murdered by organused crime. He closed the conference with the phrase, “Ya me cansé” (“Enough, I’m tired”). Almost immediately, the phrase became a hashtag and a trending topic on Twitter. People used it to express their fatigue of Mexican society towards their violent, corrupt and lying government: #YaMeCanséDeTenerMiedo (“I’m Tired of Being Afraid”). The families of the missing students claim they want their sons alive and demand irrefutable evidence of their deaths before making a conclusion. They refuse to accept only testimonies from those detained. We, as students and as a society, are with them. You don’t mess with human pain. Several protests (around 100 each time) in cities around the world and Mexico have been organised demanding the finding of the 43 missing students in Mexico, as well as the punishment of the culprits. A monumental tag was written in the main square of Mexico City: Fue el Estado (It was the State). This is our main claim. Even if they already incarcerated the local mayor of Iguala, José Luis Abarca, many responsible parties are still free. The local and federal governments are part of the same State, so the Mexican State is the direct responsible for the 43 missing students since they were in police cars, the workers of the government, the last time they were seen. Time is running short. The pain is growing, but also indignation. In a protest on November 8, the door to the National Palace in Mexico City was set on fire by unknown persons and in response there were arbitrary detention of students by policemen. Something is clear: Mexico is in pain and enraged. We have to keep an eye on the central subject here: Ayotzinapa is not a closed case. 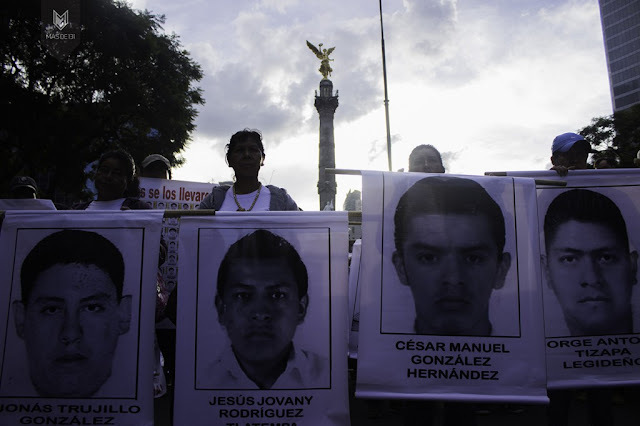 Conversely, with Ayotzinapa and the 43 missing students, Mexico is writing another history. Mexico is alive. Protests, music, global actions, letters, hashtags, websites, meetings, organisations, vigils, murals—spreading to the world and across borders. Resistance comes from different paths. They are them, but we are them. Their pain is our pain. Their rage is our rage. Nonetheless, their hope is also ours. Until justice arrives, we will remember the stories and faces of each of the 43 students. Memory is our way of resisting. They won’t silence us. Meztli Yoalli Rodríguez Aguilera is part of Yo Soy 132, a student movement in Mexico. She is currently a doctoral candidate at the Lozano Long Institute of Latin American Studies at the University of Texas, Austin, USA.